I was only guessing at direction when I blundered into blogging in February of 2006. Not wanting to be boxed-in, I chose the most non-committal of titles: Monte Asbury’s Blog. It has taken years to develop a sense of why I am here. I’m sure it will continue to change. But it looks like, now, I know enough to express a more descriptive name. The About, the profile, and other explanatory pieces will catch up soon; they’ll describe more of what it means. Most surprising, in this three-year blogging experience, has been the warmth and the brilliance of the friends met on the web. Thank you for what you have taught me, fellow readers and writers. I pray that The Least, First will be a source of fuel for the fires that so obviously burn in your hearts. Your thoughts have often ignited mine, and I am grateful. I’m afraid I don’t understand this at all!! Now here is something that amazes me. Sitemeter maps the location of the servers through which people come to visit this blog (though it doesn’t know who or precisely where they themselves are). 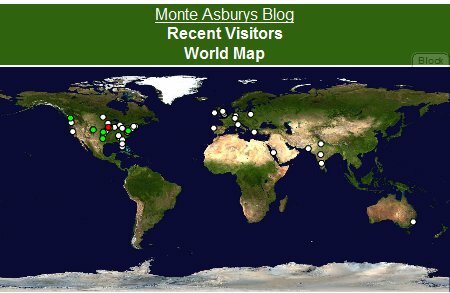 This map shows the previous 100 visits as of mid-afternoon CST on September 15, 2007 (the most recent visitor’s server is red, the next nine are green, and the rest are white). I never imagined that so many friendships would come from comparing notes with readers and bloggers on three or four continents. Thank you, friends! Whew, check this out! Here’s a list of common grammar snags from the masthead at LousyWriter. Helped me! GRAMMAR MISTAKES > Attraction > ALONE (usage) > AND relative > Broken Construction > Difficult Words > Double Negative > Each, Every, Either, Neither (usage) > First Personal Pronoun > Ellipses > Loose Participles > NONE (usage) > ONE (usage) > ONLY (usage) > Past Tense > Prespositions > Pronouns > Redundancies > Sequence of Person > Split Infinitive > Tenses > A or AN? > AM COME or HAVE COME? > BETWEEN or AMONG? > EACH OTHER or ONE ANOTHER? > EAT or ATE? > FLEE or FLY? > FURTHER or FARTHER? > IN or INTO? > LAY or LIE? > LESS or FEWER? > NEITHER or NOR? > OTHER or ANOTHER? > RISE or RAISE? > SAYS or SAID? > SUMMON or SUMMONS? > THAT or SO? > THESE or THOSE? > THIS MUCH or THUS MUCH? > THROUGH or THROUGHOUT? > UNDENIABLE or UNEXCEPTIONABLE? > VOCATION or AVOCATION? > WAS or WERE? I’ll put it in my links (under Web and Blog resources) in case you want to find it later. We find an article on the web. A paragraph in it is excellent. We bookmark (or favorite) the article. Now we have a hundred bookmarks. And we’ve long since forgotten the location of the the pithy paragraph. Maybe you’ve mastered this, but I stumbled onto something that might help me: Clipmarks looks like it will clip, email, share, post directly, even print any part of a story. Here’s a 45-second video. Might give us faster, more concise research. Sound good? I’m looking forward to what you find.